When it comes to finding home for the family, nothing beats the feeling of getting more than what a person desired. Young couple Francis and Maricel Pangan only wanted to own a condominium unit near their business in Balintawak, Quezon City after they got married in 2015. “We really wanted a condo near our business because the location itself is perfect. It’s near the market, malls, schools, church. It’s really very convenient,” said Francis, who owns a car battery buy and sell business. That was when they decided to get a unit at DMCI Homes’ Zinnia Towers since it was the condo development nearest to their area at that time. RESORT LIVING. 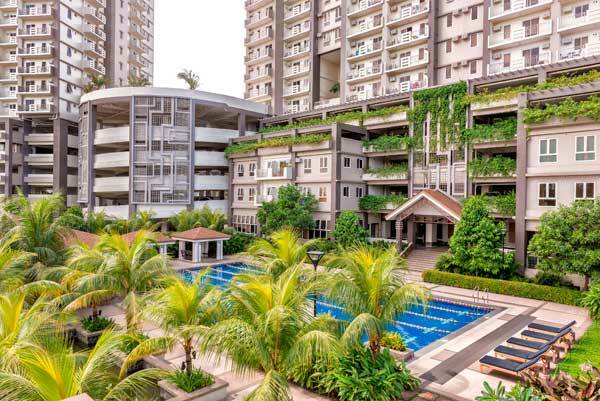 Pangan family’s home, Zinnia Towers in Balintawak, boasts resort-inspired amenities that provide residents an invigorating living experience in the middle of Quezon City district. “To be honest, we were not that familiar with DMCI Homes, but it was the nearest to our office. We also checked with other developers but we were not impressed with the furnishings and the unit cuts were too cramped,” disclosed the 31-year-old businessman and father of one. The couple chiefly wanted a home accessible to their business and urban conveniences, but was surprised when they got more than what they asked for. “The units are spacious and well-crafted. It’s also the only one with atrium. We love the idea of having an atrium every five floors because it ventilates the whole building,” shared Maricel. “It’s very homey and refreshing unlike other condos wherein you face a wall when you go out of your unit. Here in Zinnia Towers, it’s like you have an extra balcony,” she continued in reference to the developments’ signature single-loaded corridors and atriums. The landscaped atriums, Maricel pointed out, perfectly complement the condo’s resort-inspired amenities, giving residents an invigorating living experience in the middle of the bustling Quezon City district. “We love the amenities here. We love almost everything—gym, basketball court, play area for our baby, roof deck, and swimming pool for the family. Almost everything. We use them a lot. We go around the property every afternoon,” enthused Matilda’s mom. But more than the unique DMCI Homes features, it is the condo community itself which brings joy to the Pangan family. “We have social activities prepared by the Property Management Office, like during Halloween and Christmas wherein we have an opportunity to bond with other residents. We have a very good community here—close and responsible,” related Maricel. DMCI Homes’ Zinnia Towers offers its residents various amenities, such as children’s play area, fitness center, and pool, that allow them to enjoy spending time with people who matter. Amid all these pleasant surprises of living in DMCI Homes’ Zinnia Tower, Francis revealed he regrets that they only bought a two-bedroom unit instead of a three-bedroom. “If we knew beforehand that the community will turn out this good, I would have bought a three-bedroom unit. That’s is one thing I regret not doing. Until now we’re looking for a three-bedroom unit here because we plan to stay here for good,” he said. Zinnia Towers is one of the developments of DMCI Homes, the country’s first Quadruple A developer known for building quality resort-inspired communities in Mega Manila, Baguio, Boracay and Davao City. Call (02) 324-8888 or log on to www.dmcihomes.com for more information.